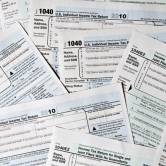 Which Tax Form Applies to You ? These days, a lot of people file their own tax returns. But you need to be careful about which ITR forms to use. Do you realise that if you buy Rs1 lakh in tax-free bonds which have coupon of 8% to 9%, you cannot file ITR-1 (Sahaj)? This is because the tax-exempt income will cross the limit of Rs5,000 allowed for ITR-1? You will have to file ITR-2, in this case. Savings account interest up to Rs10,000 is tax-exempt, but it still needs to be included in your total income for the assessment year. Interest from post-office savings is exempt up to Rs4,000, or Rs8,000 for joint accounts; PPF interest income is tax-free, but should be included in the exempt income. Some examples of exempt income are: dividend, transport allowance, house rent allowance (HRA), leave travel allowance (LTA) and interest on PPF. Showing higher or lower amounts for tax-exempt income than allowable can lead to scrutiny of your tax return. 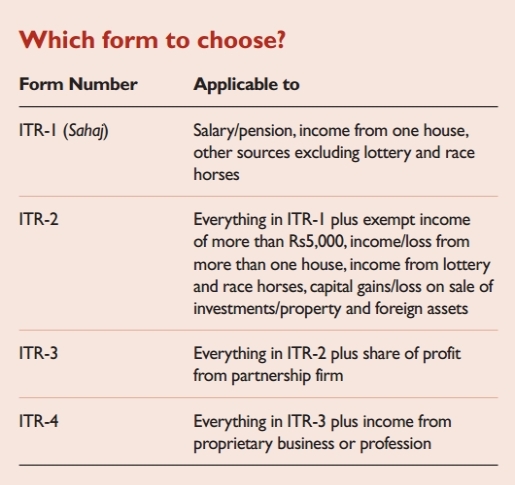 Here is a guide to which ITR to use in which case. Next Next post: Transmission of a flat in housing society or CHS?